Our professionals apply our 3-in-1 concentrated formula, which penetrates deeply to loosen dirt for an easy cleaning. The cleaner contains brighteners which removes unsightly wood discoloration while easily and safely gets rid of mold and mildew stains and dirt. Safe for pets and people. 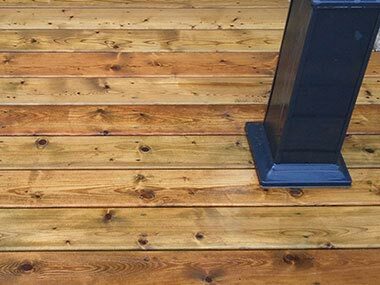 We highly recommend using this extraordinary cleaner, which has no harsh chemicals, to prepare surfaces prior to applying any stain, paint, sealer or waterproofers. 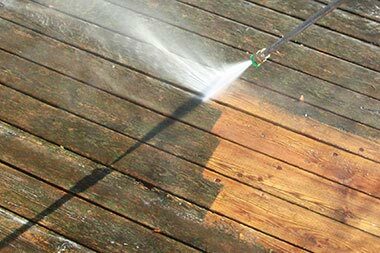 We use a mild pressure washer to remove the cleaning solution along with dirt, algae, grime or mildew that has collected on the surface. At this stage you will notice the surface looking brighter, cleaner and refreshed. Once all of the dirt has been removed our professionals spray on not one but TWO even coats of our advanced multi-surface waterproofer. 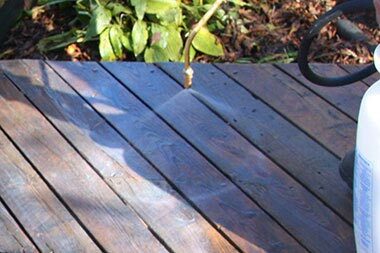 The waterproofer is a concentrated, waterbased formula designed for waterproofing wood, composite, concrete and masonry. It is eco-friendly, non-toxic with zero VOC’s and is safe for the environment. Adding this sealant will help to provide long lasting, deep penetrating protection against mold and mildew. Once your surface has dried you are good to enjoy your new clean, protected, waterproofed surface! Deck Size * sq. ft. Please attach a photo of the deck, patio, fence, etc. that you would like cleaned. © 2019, HD Outdoor Cleaners. All rights reserved.